In rural 1920s Virginia, the young Desmond Doss nearly kills his little brother Hal while roughhousing. This event and his Seventh-day Adventist upbringing reinforce Desmond's belief in the commandment "Thou shalt not kill". Years later, Doss takes an injured man to the hospital and meets a nurse, Dorothy Schutte. The two strike a romance and Doss tells Dorothy of his interest in medical work. After the Japanese attack on Pearl Harbor, Doss enlists in the Army to serve as a combat medic. His father Tom, a World War I veteran, is deeply upset by the decision. Before leaving for Fort Jackson, he asks for Dorothy's hand in marriage and she accepts. Doss is placed in basic training under the command of Sergeant Howell. He excels physically, but becomes an outcast among his fellow soldiers for refusing to handle a rifle and train on Saturdays. Howell and Captain Glover attempt to discharge Doss for psychiatric reasons under Section 8 but are overruled, as Doss' religious beliefs do not constitute mental illness. They subsequently torment Doss by putting him through grueling labor, intending to get Doss to leave of his own accord. Despite being beaten one night by his fellow soldiers, he refuses to identify his attackers and continues training. Doss' unit completes training and is released on leave, during which Doss intends to marry Dorothy, but his refusal to carry a firearm leads to an arrest for insubordination. Captain Glover and Dorothy visit Doss in jail and try to convince him to plead guilty so that he can be released without charge, but Doss refuses to compromise his beliefs. At his court-martial Doss pleads not guilty, but before he is sentenced, his father barges into the tribunal with a letter from his former commanding officer (now a brigadier general) stating that his son's pacifism is protected by an Act of Congress. The charges against Doss are dropped, and he and Dorothy are married. Doss' unit is assigned to the 77th Infantry Division and deployed to the Pacific theater. During the Battle of Okinawa, Doss' unit is informed that they are to relieve the 96th Infantry Division, which was tasked with ascending and securing the Maeda Escarpment ("Hacksaw Ridge"). During the initial fight, with heavy losses on both sides, Doss saves the life of his squadmate Smitty, earning his respect. As the Americans camp for the night, Doss reveals to Smitty that his aversion to holding a firearm stems from nearly shooting his drunken father, who threatened his mother with a gun. Smitty apologizes for doubting his courage, and the two reconcile. The next morning, the Japanese launch a massive counterattack and drive the Americans off the escarpment. Smitty is killed, while Howell and several of Doss' squad mates are left injured on the battlefield. 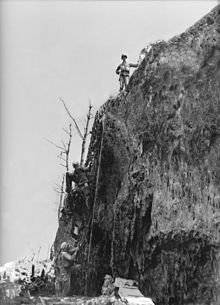 Doss hears the cries of dying soldiers and returns to save them, carrying the wounded to the cliff's edge and belaying them down by rope, each time praying to save one more. The arrival of dozens of wounded once presumed dead comes as a shock to the rest of the unit below. When day breaks, Doss rescues Howell and the two escape Hacksaw under enemy fire. Captain Glover tells Doss that the men have been inspired by his selflessness, and that they will not launch the next attack without him. With reinforcements, they turn the tide of battle. After an ambush set by Japanese soldiers feigning surrender, Doss manages to save Glover and others by deflecting enemy grenades. Doss is eventually wounded by a grenade blast, but the battle is won. Doss descends the cliff, clutching the Bible Dorothy gave him. The film switches to archival photos and footage showing that Doss was awarded the Medal of Honor by President Harry S. Truman for rescuing 75 soldiers at Hacksaw Ridge. Doss stayed married to Dorothy until her death in 1991. He died on March 23, 2006, at the age of 87. Hacksaw Ridge was in development limbo for fourteen years. Numerous producers had tried for decades to film Doss' story, including decorated war hero Audie Murphy and Hal B. Wallis. In 2001, after finally convincing Doss that making a movie on his remarkable life was the right thing to do, screenwriter/producer Gregory Crosby (grandson of Bing Crosby) wrote the treatment and brought the project to film producer David Permut, of Permut Presentations, through the early cooperation of Stan Jensen of the Seventh-day Adventist Church, which ultimately led to the film being financed. In 2004, director Terry Benedict won the rights to make a documentary about Doss, The Conscientious Objector, and secured the dramatic film rights in the process. However, Doss died in 2006, after which producer Bill Mechanic acquired and then sold the rights to Walden Media, which developed the project along with producer David Permut. Gregory Crosby and Steve Longi served as co-producers. Walden Media insisted on a PG-13 version of the battle, and Mechanic spent years working to buy the rights back. After acquiring the rights, Mechanic approached Mel Gibson, and wanted him to create a concoction of violence and faith, as he did with The Passion of the Christ (2004). Gibson turned down the offer twice, as he previously did with Braveheart (1995). Nearly a decade later, Gibson finally agreed to direct, a decision announced in November 2014. The same month, Andrew Garfield was confirmed to play the role of Desmond Doss. With a budget of $40 million, the team still faced many challenges. 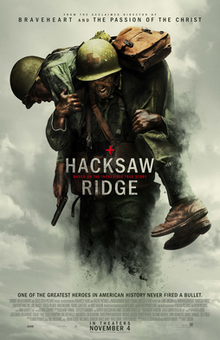 Hacksaw Ridge became an international co-production, with key players and firms located in both the United States and Australia. When Australian tax incentives were taken off the table, the film had to qualify as Australian to receive government subsidies. Despite being American-born, Gibson's early years in Australia helped the film qualify, along with most of the cast being Australian, including Rachel Griffiths (Doss' mother), Teresa Palmer (Doss' wife), Sam Worthington (unit leader), Hugo Weaving (as Doss' father), Richard Roxburgh (as a colonel) and Luke Bracey (as Smitty, one of Doss' most antagonistic unit members). Rounding out the cast was American actor Vince Vaughn. According to producer Bill Mechanic, Australian state and federal subsidies made financing the film possible. On February 9, 2015, IM Global closed a deal to finance the film, and also sold the film into the international markets. On the same day, Lionsgate acquired the North American distribution rights to the film. Chinese distribution rights were acquired by Bliss Media, a Shanghai-based film production and distribution company. Hacksaw Ridge is the first film directed by Gibson since Apocalypto in 2006, and marks a departure from his previous films, such as Apocalypto and Braveheart, in which the protagonists acted violently. Robert Schenkkan made the initial draft and Randall Wallace, who was previously attached to direct the film, rewrote the script. Andrew Knight polished the revised script. Gibson's partner Bruce Davey also produced the film, along with Paul Currie. The cast – Andrew Garfield, Vince Vaughn, Sam Worthington, Luke Bracey, Teresa Palmer, Rachel Griffiths, Richard Roxburgh, Luke Pegler, Richard Pyros, Ben Mingay, Firass Dirani, Nico Cortez, Michael Sheasby, Goran Kleut, Jacob Warner, Harry Greenwood, Damien Thomlinson, Ben O'Toole, Benedict Hardie, Robert Morgan, Ori Pfeffer, Milo Gibson, and Nathaniel Buzolic, Hugo Weaving, and Ryan Corr – was announced between November 2014 and October 2015. The younger Doss was played by Darcy Bryce. Garfield plays Desmond Doss, a US Army medic awarded the Medal of Honor by President Harry S. Truman for saving lives during the Battle of Okinawa in World War II. Garfield had high regards for Doss, and venerated him for his act of bravery, hailing him as a "wonderful symbol of embodying the idea of live and let live no matter what your ideology is, no matter what your value system is, just to allow other people to be who they are and allow yourself to be who you are." He found the idea of playing a real superhero, as compared to his past roles playing Spider-Man in The Amazing Spider-Man and its sequel, much more inspiring. Garfield admitted that he cried the first time he read the screenplay. He visited Doss' hometown and touched his various tools. Gibson was drawn to Garfield the first time he saw his performance in The Social Network. Palmer wanted a role in the film so badly that she auditioned via phone, and sent the recording to Gibson. She heard nothing back for three months, until Gibson called Palmer to tell her in a Skype chat that he had cast her in the role of Dorothy, Doss' wife. Principal photography started on September 29, 2015, and lasted for 59 days, ending in December of that year. Filming took place entirely in Australia. The film was based at Fox Studios in Sydney, after producers vigorously scouted for locations around the country. Filming took place mostly in the state of New South Wales — where Gibson spent much of his early years — in and around Sydney such as in Richmond, Bringelly, and Oran Park. Gibson moved to the state in July 2015, two months before filming began. The graveyard scene was shot at a set-constructed cemetery in Sydney's Centennial Park. The grounds of Newington Armory at Sydney Olympic Park were used as Fort Jackson. Filming in Bringelly required the team to clear and deforest over 500 hectares of land, which evoked the ire of some environmentalists. However, the producers had complete approval and clearance to do so. Also conditions were imposed to replant and rehabilitate part of the land after filming ceased. According to Troy Grant, New South Wales' deputy premier and minister for the arts, the film brought 720 jobs and US$19 million to regional and rural New South Wales. Altogether, three jeeps, two trucks and a tank were featured in the film. Bulldozers and backhoes were used to transform a dairy pasture near Sydney to re-create the Okinawa battlefield. A berm had to be raised around the perimeter so cameras could turn 360 degrees without getting any eucalyptus trees in the background. Gibson did not want to rely heavily on computer visual effects, either on the screen or in pre-visualizing the battle scenes. Visual effects were used only during bloody scenes, like napalm-burnt soldiers. During filming of the war scenes, Gibson incorporated his past war-movie experiences, and would yell to the actors, reminding them constantly of what they were fighting for. Kevin O'Connell, who won his first Academy Award for sound mixing in this film (after 20 nominations), stated that budget constraints forced him to utilize archival sounds of WWII-era weapons. The film has been described as an anti-war film, with pacifist themes. It also incorporates recurring religious imagery, such as baptism and ascension. After the war, Doss turned down many requests for books and film versions of his actions, because he was wary of whether his life, wartime experiences, and Seventh-day Adventist beliefs would be portrayed inaccurately or sensationally. Doss' only child, Desmond Doss Jr., stated: "The reason he declined is that none of them adhered to his one requirement: that it be accurate. And I find it remarkable, the level of accuracy in adhering to the principal of the story in this movie." Producer David Permut stated that the filmmakers took great care in maintaining the integrity of the story, since Doss was very religious. However, the filmmakers did change some details, notably the backstory about his father, the incident with the gun Doss took out of his alcoholic father's hands, and the circumstances of his first marriage. The character of Smitty, portrayed by Luke Bracey, is an amalgamation of various soldiers who tormented Doss and was created for narrative reasons. Other changes to the story occur near the end of the movie when Doss is placed on a stretcher. In real life, Doss had another wounded man take his place on the stretcher. After treating the soldier, a sniper shot fractured Doss' arm and he crawled over 300 yards to safety after being left alone for five hours. Gibson omitted this from the film because he felt that the audience would not find the scene believable. The film also omits his prior combat service in the Battle of Guam and Battle of Leyte (Doss was awarded the Bronze Star Medal for extraordinary bravery in both battles), and leaves the impression that Doss' actions at Okinawa took place over a period of a few days, though his Medal of Honor citation covered his actions over a period of about three weeks (April 29 to May 21). The film's score was recorded at Abbey Road Studios in London. James Horner was originally approached to compose the score for the film but was replaced by John Debney after Horner's untimely death in 2015. Debney was himself replaced by Rupert Gregson-Williams after his score was rejected before Hacksaw Ridge was set to premiere at the Venice Film Festival. When composing the music Gregson-Williams commented: "The soundtrack is really in two parts. A lovely romance blossoms as Desmond discovers both the love of his life and his faith. The second half of the movie is brutal...We wanted to reflect his spirituality without being pious, and his bravery without celebrating violence." The film's accompanying score was recorded at Abbey Road Studios in London, with an orchestra of 70 musicians and a 36-voice choir conducted by Cliff Masterson. All tracks written by Rupert Gregson-Williams. The world premiere of Hacksaw Ridge occurred on September 4, 2016, at the 73rd Venice Film Festival, where it received a 10-minute standing ovation. The film was released in Australia on November 3, 2016, by Icon Film Distribution, and in the United States on November 4, 2016, by Lionsgate/Summit Entertainment. It was released by Bliss Media in China in November, and in the United Kingdom in 2017, with IM Global handling international sales. On July 28, 2016, Lionsgate released the only official trailer for Hacksaw Ridge which garnered millions of views. In partnership with Disabled American Veterans, Gibson screened the film at both the DAV National Convention and VFW National Convention in August 2016 to raise awareness of veterans' issues. Within the same month, Gibson also appeared at Pastor Greg Laurie's SoCal Harvest in Anaheim, California to promote the film. A number of Seventh-day Adventist ministries offered free copies of the Hero of Hacksaw Ridge book during the film's release as well as created promotional materials to highlight Doss' faith. On February 24, 2017, Reto-Moto and Lionsgate announced a cross-promotion where the purchase of a DLC pack for Heroes & Generals would also give the purchaser a digital copy of the film. Hacksaw Ridge grossed $67.1 million in the United States and Canada and $108.2 million in other countries for a worldwide total of $175.3 million, against a production budget of $40 million. The film opened alongside Doctor Strange and Trolls, and was projected to gross around $12 million from 2,886 theaters. It was expected to play very well among faith-based, Midwest, and Southern audiences. It made $5.2 million on its first day and $15.2 million in its opening weekend, finishing third at the box office behind Doctor Strange and Trolls. The debut was on par with the $15 million opening of Gibson's last directorial effort, Apocalypto, in 2006. In its second weekend, the film grossed $10.6 million (a drop of just 30%), finishing 5th at the box office. The film also opened successfully in China, grossing over $16 million in its first four days at the box office and over $60 million in total. On review aggregator Rotten Tomatoes, the film has an approval rating of 86% based on 245 reviews, with an average rating of 7.2/10. The site's critical consensus reads, "Hacksaw Ridge uses a real-life pacifist's legacy to lay the groundwork for a gripping wartime tribute to faith, valor, and the courage of remaining true to one's convictions." On Metacritic, the film has a weighted average score of 71 out of 100, based on 47 critics, indicating "generally favorable reviews". Audiences polled by CinemaScore gave an average grade of "A" on an A+ to F scale, while PostTrak reported filmgoers gave it a 91% overall positive score and a 67% "definite recommend." The Milford Daily News called the film a "masterpiece", adding that it "is going to end up on many 2016 Top 10 lists, that should get Oscar nominations for Best Actor, Best Director and Best Picture." Maggie Stancu of Movie Pilot wrote that "Gibson made some of his most genius directing choices in Hacksaw Ridge, and Garfield has given his best performance yet. With amazing performances by Vince Vaughn, Teresa Palmer, Sam Worthington and Hugo Weaving, it is absolutely one of 2016's must-see films." Mick LaSalle of SFGate called the film "a brilliant return for Mel Gibson, which confirms his position as a director with a singular talent for spectacle and a sure way with actors." In The Film Lawyers, Samar Khan called Hacksaw Ridge "fantastic," and emphasised "just how wonderful it is to have Gibson back in a more prominent position in Hollywood, hopefully with the demons of his past behind him. If Hacksaw Ridge is any indication, we are poised for a future filled with great films from the visionary director." The Daily Telegraph awarded four stars, and added: "Hacksaw Ridge is a fantastically moving and bruising war film that hits you like a raw topside of beef in the face – a kind of primary-coloured Guernica that flourishes on a big screen with a crowd." The Guardian also awarded the film four stars, and stated that Gibson had "absolutely hit Hacksaw Ridge out of the park." The Australian's reviewer was equally positive, stating that, as a director, "Gibson's approach is bold and fearless; this represents his best work to date behind the camera." Rex Reed of Observer rated it with four stars, and called it "the best war film since Saving Private Ryan... [I]t is violent, harrowing, heartbreaking and unforgettable. And yes, it was directed by Mel Gibson. He deserves a medal, too" Michael Smith of Tulsa World called Hacksaw Ridge a "moving character study" and praised both the direction and acting: "It's truly remarkable how Gibson can film scenes of such heartfelt emotion with such sweet subtlety as easily as he stages some of the most vicious, visual scenes of violence that you will ever see. ... Hacksaw Ridge is beautiful and brutal, and that's a potent combination for a movie about a man determined to serve his country, as well as his soul." IGN critic Alex Welch gave a score of 8/10, praising it as "one of the most successful war films of recent memory," and "at times horrifying, inspiring, and heart-wrenching." Mike Ryan of Uproxx gave the film a positive review, praising Gibson's direction and saying, "There are two moments during the second half of Mel Gibson's Hacksaw Ridge when I literally jumped out of my seat in terror. The film's depiction of war is the best I've seen since Saving Private Ryan." Peter Travers of Rolling Stone gave the film 3.5 stars, writing, "Thanks to some of the greatest battle scenes ever filmed, Gibson once again shows his staggering gifts as a filmmaker, able to juxtapose savagery with aching tenderness." In contrast, Matt Zoller Seitz for RogerEbert.com gave the film 2.5 stars, and described the film as "a movie at war with itself." Hacksaw Ridge won Best Film Editing and Best Sound Mixing and was nominated for Best Picture, Best Director, Best Actor for Garfield and Best Sound Editing at the Academy Awards. The film won Best Editing and was nominated for Best Actor in a Leading Role for Garfield, Best Adapted Screenplay, Best Sound and Best Makeup and Hair at the British Academy Film Awards. The film won Best Action Movie and Best Actor in an Action Movie for Garfield and was nominated for Best Picture, Best Director, Best Actor for Garfield, Best Editing and Best Hair and Makeup at the Critics' Choice Awards. The film received three nominations at the Golden Globe Awards, including Best Motion Picture – Drama, Best Actor – Motion Picture Drama for Garfield and Best Director. The film won Best Actor for Garfield, Best Film Editing and Best Sound and was nominated for Best Film, Best Director, Best Adapted Screenplay, Best Cinematography, Best Original Score and Best Art Direction and Production Design at the Satellite Awards. ^ "Lions Gate Entertainment 2016 Q3 10-Q". sec.gov. Archived from the original on March 1, 2017. Retrieved March 1, 2017. ^ "Hacksaw Ridge (15)". British Board of Film Classification. December 5, 2016. Archived from the original on December 20, 2016. Retrieved December 6, 2016. ^ a b c Brooks Barnes (October 26, 2016). "'Hacksaw Ridge,' a Gory War Movie for Both Hawks and Doves". The New York Times. Archived from the original on October 30, 2016. Retrieved October 27, 2016. ^ "'Doctor Strange' To Give Booster Shot To Sleepy Fall Box Office". Deadline Hollywood. Archived from the original on November 2, 2016. ^ a b c "Hacksaw Ridge (2016)". Box Office Mojo. Archived from the original on April 9, 2017. Retrieved March 10, 2017. ^ "THE 89TH ACADEMY AWARDS". Academy of Motion Picture Arts and Sciences. February 26, 2017. Archived from the original on March 3, 2017. Retrieved June 14, 2017. ^ a b "Golden Globes 2017: The Complete List of Nominations". The Hollywood Reporter. December 12, 2016. Archived from the original on December 13, 2016. Retrieved December 12, 2016. ^ a b c Michael Peabody (February 3, 2016). "Gibson's "Hacksaw Ridge" Enters Post-Production: Release Target in Time for Oscar?". Religious Liberty. Archived from the original on September 19, 2016. Retrieved September 11, 2016. ^ a b Don Steinberg (September 8, 2016). "'Hacksaw Ridge': An American War Hero Who Refused to Fight". The Wall Street Journal. Archived from the original on September 18, 2016. Retrieved September 18, 2016. ^ a b c Jaafar, Ali (November 20, 2014). "Mel Gibson In Talks To Direct 'Hacksaw Ridge' With Andrew Garfield Starring In War Hero Pic". Deadline Hollywood. Archived from the original on November 23, 2014. Retrieved November 23, 2014. ^ "Hacksaw Ridge: Mel Gibson's New Biopic War Film, Starring Andrew Garfield - Emanuel Levy". Emanuel Levy. Archived from the original on October 31, 2016. Retrieved January 14, 2017. ^ McNary, Dave (November 4, 2015). "AFM: How Mel Gibson's 'Hacksaw Ridge' Finally Came Together". Variety. Archived from the original on February 16, 2017. Retrieved January 14, 2017. ^ a b c d e f g Don Steinberg (October 26, 2016). "How War-Movie Veteran Mel Gibson Approached Directing 'Hacksaw Ridge'". The Wall Street Journal. Archived from the original on October 27, 2016. Retrieved October 27, 2016. ^ "Hacksaw Ridge: Mel Gibson's Comeback". October 27, 2016. Archived from the original on November 7, 2016. Retrieved November 7, 2016. ^ Bizzaca, Caris (September 5, 2016). "Hacksaw Ridge: between indie and franchise". Screen Australia. Retrieved April 20, 2018. ^ Hopewell, John (February 9, 2015). "Berlin: IM Global Sells Much of the World on 'Hacksaw Ridge'". Variety. Archived from the original on February 10, 2015. Retrieved February 10, 2015. ^ McClintock, Pamela (February 9, 2015). "Berlin: Lionsgate in Final Talks for Mel Gibson's 'Hacksaw Ridge' (Exclusive)". The Hollywood Reporter. Archived from the original on February 11, 2015. Retrieved February 10, 2015. ^ "China's Bliss Media Takes Stake in Wild Bunch's Insiders". The Hollywood Reporter. Archived from the original on March 20, 2016. Retrieved March 18, 2016. ^ Pip Bulbeck (July 30, 2015). "Mel Gibson Ready to Honor Desmond T. Doss with 'Hacksaw Ridge'". The Hollywood Reporter. Archived from the original on May 7, 2016. Retrieved September 11, 2016. ^ a b c Pip Bulbeck (September 29, 2015). "Mel Gibson's 'Hacksaw Ridge' Begins Filming". The Hollywood Reporter. Archived from the original on April 13, 2016. Retrieved September 11, 2016. ^ a b Mike Fleming Jr (September 6, 2016). "Mel Gibson On His Venice Festival Comeback Picture 'Hacksaw Ridge' – Q&A". Deadline Hollywood. Archived from the original on September 10, 2016. Retrieved September 11, 2016. ^ Mcnary, Dave (November 4, 2015). "AFM: How Mel Gibson's 'Hacksaw Ridge' Finally Came Together". Variety. Retrieved April 20, 2018. ^ Bond, Paul (June 9, 2016). "Mel Gibson Planning 'Passion of the Christ' Sequel (Exclusive)". The Hollywood Reporter. Retrieved January 31, 2018. ^ a b Bulbeck, Pip (July 30, 2015). "Mel Gibson Ready to Honor Desmond T. Doss with 'Hacksaw Ridge'". The Hollywood Reporter. Archived from the original on August 2, 2015. Retrieved August 1, 2015. ^ Fleming Jr, Mike (July 29, 2015). "Vince Vaughn To Star In Mel Gibson-Directed 'Hacksaw Ridge'". Deadline Hollywood. Archived from the original on July 31, 2015. Retrieved August 1, 2015. ^ Fleming, Mike, Jr. (August 25, 2015). "Luke Bracey Lands Lead in Mel Gibson's 'Hacksaw Ridge'". Deadline Hollywood. Archived from the original on August 26, 2015. Retrieved August 26, 2015. ^ McNary, Dave (September 29, 2015). "First Look: Andrew Garfield and Vince Vaughn in Mel Gibson's 'Hacksaw Ridge'". variety.com. Archived from the original on October 29, 2015. Retrieved November 9, 2015. ^ McNary, Dave (October 19, 2015). "Hugo Weaving Joins Mel Gibson's 'Hacksaw Ridge'". variety.com. Archived from the original on November 1, 2015. Retrieved November 9, 2015. ^ Anthony Lane (October 31, 2016). "THE MADNESS AND MAJESTY OF "HACKSAW RIDGE"". The New Yorker. Archived from the original on October 31, 2016. Retrieved October 31, 2016. ^ Ariston Anderson (September 9, 2016). "Venice: Mel Gibson, Andrew Garfield Discuss the "Strong Faith" Behind 'Hacksaw Ridge' Play Video". The Hollywood Reporter. Archived from the original on September 10, 2016. Retrieved September 11, 2016. ^ "Mel Gibson makes a comeback in war drama 'Hacksaw Ridge'". Gulf News. Archived from the original on October 28, 2016. Retrieved October 27, 2016. ^ "Mel Gibson on Andrew Garfield in 'Hacksaw Ridge': He Was a 'Real Superhero'". Variety. October 25, 2016. Archived from the original on October 28, 2016. Retrieved October 28, 2016. ^ Monique Friedlander (October 18, 2016). "'I really wanted this role': Teresa Palmer auditioned for Hacksaw Ridge via IPHONE... and waited three months to hear back from director Mel Gibson". Daily Mail. Archived from the original on October 19, 2016. Retrieved October 18, 2016. ^ Ethan Sacks (October 30, 2016). "Mel Gibson's war movie 'Hacksaw Ridge' may be his miracle". New York Daily News. Archived from the original on October 31, 2016. Retrieved October 31, 2016. ^ Garry Maddox (July 28, 2015). "Short Cuts: Mel Gibson's Hacksaw Ridge has landed, emotional opening for Melbourne festival and more from Australian film". The Sydney Morning Herald. Archived from the original on October 11, 2016. Retrieved September 11, 2016. ^ Bianca La Cioppa (December 1, 2015). "EXCLUSIVE: Mel Gibson's Hacksaw Ridge takes semi-rural town back to 1940s as filming begins despite local shopkeepers' urgent meeting to protest AGAINST movie". Daily Mail. Archived from the original on January 1, 2017. Retrieved September 11, 2016. ^ Luisa Cogno (August 3, 2016). "Mel Gibson's war movie Hacksaw Ridge filmed in Bringelly to open in cinemas in November". The Daily Telegraph. Archived from the original on August 5, 2016. Retrieved September 11, 2016. ^ Amy Harris (August 27, 2016). "Sydney is the movie capital of Australia". The Daily Telegraph. Archived from the original on September 2, 2016. Retrieved September 11, 2016. ^ Jason Chester (September 23, 2016). "Mel Gibson begins work on World War II drama Hacksaw Ridge as uniform-clad actors film assault course scene in Sydney". Daily Mail. Archived from the original on March 27, 2016. Retrieved September 11, 2016. ^ Megan Pustetto (November 24, 2015). "He means business: Mel Gibson shoots WWII drama Hacksaw Ridge in eerie Sydney graveyard... and is seen for the first time with Vince Vaughn and Andrew Garfield". Daily Mail. Archived from the original on January 1, 2017. Retrieved September 11, 2016. ^ Vera Bertol (October 30, 2015). "Movie set earmarked for residential development when filming done". The Daily Telegraph. Retrieved September 11, 2016. ^ Alexandra Spring (July 30, 2015). "Mel Gibson war drama Hacksaw Ridge to begin filming in NSW in September". The Guardian. Archived from the original on September 6, 2016. Retrieved September 11, 2016. ^ Matt Grobar (December 15, 2016). "'Hacksaw Ridge' Sound Mixer Kevin O'Connell On Producing A PTSD-Triggering Soundscape". Deadline Hollywood. Retrieved November 10, 2017. ^ Samuel Smith (October 1, 2016). "Mel Gibson: 'Hacksaw Ridge' Is an 'Anti-War Movie'". The Christian Post. Archived from the original on December 11, 2016. Retrieved October 10, 2016. ^ a b c "The True Story of Hacksaw Ridge and Desmond Doss: the Medal of Honor Winner Who Never Fired a Shot". People. November 5, 2016. Archived from the original on January 18, 2017. Retrieved January 14, 2017. ^ "Hacksaw Ridge vs the True Story of Desmond Doss, Medal of Honor". historyvshollywood.com. Archived from the original on January 28, 2017. Retrieved January 14, 2017. ^ Fred Topel (November 3, 2016). "Hacksaw Ridge Interview: Luke Bracey on Smitty". Nerd Report. Retrieved December 5, 2017. ^ a b Richard Goldstein (March 25, 2006). "Desmond T. Doss, 87, Heroic War Objector, Dies". New York Times. Archived from the original on June 19, 2016. Retrieved June 16, 2013. ^ Mike Fleming Jr (February 15, 2017). "Mel Gibson, Andrew Garfield And Bill Mechanic On The 15-Year Ordeal To Scale 'Hacksaw Ridge'". Deadline Hollywood. Retrieved December 5, 2017. ^ James Bowman (November 25, 2016). "What Makes Mel Gibson's 'Hacksaw Ridge' an Excellent War Movie". The American Spectator. Retrieved December 5, 2017. ^ "The Medal of Honor". desmonddoss.com. Retrieved December 5, 2017. ^ Bernhard H. Heidkamp (November 4, 2016). "Soundtrack Review: Rupert Gregson-Williams – Hacksaw Ridge (2016)". BehindTheAudio.com. Retrieved November 10, 2017. ^ Jonathan Broxton (November 1, 2016). "HACKSAW RIDGE – Rupert Gregson-Williams". Movie Music UK. Retrieved November 10, 2017. ^ "Five Questions w/Rupert Gregson Williams (HACKSAW RIDGE)". Varèse Sarabande. Retrieved November 10, 2017. ^ Melinda Newman (October 26, 2016). "'Hacksaw Ridge' Composer Rupert Gregson-Williams on Working With Mel Gibson; Hear Score". Billboard. Archived from the original on October 27, 2016. Retrieved October 27, 2016. ^ Tartaglione, Nancy (July 28, 2016). "Venice Film Festival: Lido To Launch Pics From Ford, Gibson, Malick & More As Awards Season Starts To Buzz – Full List". Deadline Hollywood. Archived from the original on September 4, 2016. Retrieved September 6, 2016. ^ Nancy Tartaglione (September 5, 2016). "Mel Gibson's 'Hacksaw Ridge' Rivets With 10-Minute Ovation At World Premiere – Venice". Deadline Hollywood. Archived from the original on September 9, 2016. Retrieved September 11, 2016. ^ Cogono, Luisa; Chronicle Camden, Macarthur (August 3, 2016). "Mel Gibson's war movie Hacksaw Ridge filmed in Bringelly to open in cinemas in November". Daily Telegraph. Archived from the original on August 5, 2016. Retrieved September 6, 2016. ^ D'Alessandro, Anthony (May 5, 2016). "Mel Gibson WWII Movie 'Hacksaw Ridge' Jumps Into November Awards Season; 'The Shack' To Open In March 2017". Deadline Hollywood. Archived from the original on May 5, 2016. Retrieved May 6, 2016. ^ Patrick Brzeski (May 16, 2016). "China's Bliss Media Launches $150 Million Film and TV Fund". The Hollywood Reporter. Archived from the original on October 12, 2016. Retrieved September 11, 2016. ^ Patrick Frater (May 16, 2016). "China's Bliss Media Launches $150 Million Fund". Variety. Archived from the original on September 21, 2016. Retrieved September 11, 2016. ^ Phil De Semlyen (September 22, 2016). "Exclusive: Mel Gibson talks Hacksaw Ridge". Empire. Archived from the original on September 23, 2016. Retrieved September 24, 2016. ^ "Hacksaw Ridge (2016) Official Trailer – "Believe" - Andrew Garfield". Lionsgate. July 28, 2016. Retrieved April 20, 2018. ^ Hunter, M. Todd (November 1, 2016). "Hacksaw Ridge partners with DAV". DAV. Retrieved April 20, 2018. ^ Jardine Malado (October 6, 2016). "Mel Gibson's new Christian film 'Hacksaw Ridge' receives 10-minute standing ovation; Movie hits U.S. theaters November 2016". The Christian Times. Archived from the original on October 7, 2016. Retrieved October 8, 2016. ^ "Hero of Hacksaw Ridge Book Giveaway". Amazing Facts. Retrieved April 20, 2018. ^ "Hacksaw Ridge Promotion". Amazing Facts. November 12, 2016. Retrieved April 20, 2018. ^ "Hacksaw Ridge". SermonView. Retrieved April 20, 2018. ^ Bradshaw, John (September 16, 2016). "Why 'Hacksaw Ridge' Matters to Adventists". Adventist Review. Retrieved April 20, 2018. ^ Voloshyn, Dmytro (February 24, 2017). "HEROES & GENERALS HAS CROSS-PROMOTION WITH HACKSAW RIDGE". KeenGamer. Retrieved April 20, 2018. ^ Ryan Faughnder (November 1, 2016). "'Doctor Strange' is expected to draw a massive audience for Disney's Marvel Studios". Los Angeles Times. Archived from the original on November 2, 2016. Retrieved November 2, 2016. ^ Anthony D'Alessandro (November 1, 2016). "'Doctor Strange' To Give Booster Shot To Sleepy Fall Box Office". Deadline Hollywood. Archived from the original on November 2, 2016. Retrieved November 2, 2016. ^ a b D'Alessandro, Anthony (November 5, 2016). "'Doctor Strange' Resuscitates Fall Box Office With $81M To $83M+ Opening – Saturday AM Update". Deadline Hollywood. Archived from the original on November 9, 2016. Retrieved November 5, 2016. ^ D'Alessandro, Anthony (November 13, 2016). "Veterans Day Weekend Skyrockets At The B.O. : 'Doctor Strange' Pushes Disney To Record $2.3B; 'Arrival' Soars To $24M – Sunday AM Update". Deadline Hollywood. Retrieved April 24, 2018. ^ "'Doctor Strange' to Repeat at #1 as 'Arrival', 'Almost Christmas' & 'Shut In' Hit Theaters". Box Office Mojo. Archived from the original on November 13, 2016. ^ "Hacksaw Ridge foreign gross". Box Office Mojo. 2016. Retrieved April 8, 2018. ^ "Hacksaw Ridge (2016)". Rotten Tomatoes. Fandango. Archived from the original on February 2, 2017. Retrieved April 23, 2018. ^ "Hacksaw Ridge Reviews". Metacritic. CBS Interactive. Archived from the original on November 14, 2016. Retrieved November 13, 2016. ^ CinemaScore on Twitter (November 4, 2016). "Hacksaw Ridge". Archived from the original on April 22, 2017. Retrieved April 12, 2017. ^ Ed Symkus (November 2, 2016). "MOVIE REVIEW: 'Hacksaw Ridge' is a masterpiece". Milford Daily News. Archived from the original on December 27, 2016. Retrieved December 27, 2016. ^ Maggie Stancu (November 18, 2016). "Why 'Hacksaw Ridge' Is One Of The Must-See Movies Of The Year". Movie Pilot. Archived from the original on December 27, 2016. Retrieved December 27, 2016. ^ Mick LaSalle (November 3, 2016). "Amid much gore, Mel Gibson achieves an antiwar triumph". SFGate. Archived from the original on December 27, 2016. Retrieved December 27, 2016. ^ Samar Khan. "Mel Gibson makes his triumphant return with the fantastic Hacksaw Ridge". The Film Lawyers. Archived from the original on December 27, 2016. Retrieved December 27, 2016. ^ Robbie Collin (November 4, 2016). "Hacksaw Ridge review: Mel Gibson goes to war with a bruising, fantastically moving comeback". The Telegraph. Archived from the original on December 25, 2016. Retrieved December 25, 2016. ^ Andrew Pulver (September 4, 2016). "Hacksaw Ridge review – Mel Gibson finds a conscience in gruesome war story". The Guardian. Archived from the original on December 25, 2016. Retrieved December 25, 2016. ^ David Stratton (November 5, 2016). "Film reviews: Mel Gibson's Hacksaw Ridge; The Light Between Oceans". The Australian. Archived from the original on November 7, 2016. Retrieved December 25, 2016. ^ Rex Reed (November 2, 2016). "Mel Gibson's 'Hacksaw Ridge' Is the Best War Film Since 'Saving Private Ryan'". Observer. Archived from the original on December 25, 2016. Retrieved December 25, 2016. ^ Michael Smith (November 2, 2016). "Movie review: 'Hacksaw Ridge' is moving character study and brutal". Tulsa World. Retrieved December 25, 2016. ^ Welch, Alex (November 2, 2016). "Hacksaw Ridge Review: A brutal and effective filmmaking return for Mel Gibson". IGN. Archived from the original on November 7, 2016. Retrieved November 7, 2016. ^ Ryan, Mike (November 1, 2016). "Mel Gibson's 'Hacksaw Ridge' Is The Most Intense Depiction Of War Since 'Saving Private Ryan'". Uproxx. Archived from the original on November 7, 2016. Retrieved November 7, 2016. ^ Travers, Peter (November 2, 2016). "'Hacksaw Ridge' Review: Mel Gibson Returns With a War Movie About Peace". Rolling Stone. Archived from the original on November 7, 2016. Retrieved November 7, 2016. ^ Seitz, Matt Zoller (November 4, 2016). "Hacksaw Ridge". RogerEbert.com. Archived from the original on November 6, 2016. Retrieved November 7, 2016. ^ "La La Land Leads with 12 Nominations for the 22nd Annual Critics' Choice Awards". Critics' Choice. December 1, 2016. Archived from the original on November 30, 2016. Retrieved December 1, 2016. ^ Kilday, Gregg (November 29, 2016). "Satellite Awards Nominees Revealed". The Hollywood Reporter. Archived from the original on December 25, 2016. Retrieved November 29, 2016. Leepson, Marc (2015). "Desmond Thomas Doss (1919–2006)". Dictionary of Virginia Biography. Library of Virginia. Retrieved July 11, 2016. This page was last edited on 15 April 2019, at 03:28 (UTC).